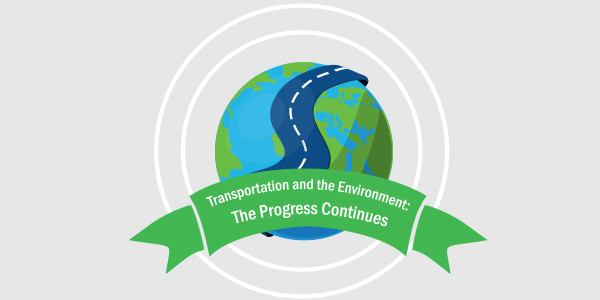 Transportation infrastructure development and the natural environment have always been interconnected, and the 47th annual Earth Day (April 22) is a good time to take stock of that relationship. Contrary to what some would have you believe, on both sides of the environmental challenge—building and transportation infrastructure use—major progress has been made in recent decades. And more will be coming. Through the use of new technologies in motor vehicles, innovative project design and construction, cleaner-burning fuels, landscape improvements and intensive recycling of waste materials, the transportation sector has been a driving force in much of the major improvement in the U.S. environment over the past 45+ years. These achievements have come despite the more than doubling of the U.S. population, soaring number of vehicle miles traveled and continued economic growth. ARTBA has produced a series of graphs and charts, based on data from industry associations and federal agencies, which highlights that progress. Take a look at the linked document and share it with your industry colleagues. You also can help distribute this content via social media by retweeting the Earth Day-related infographs that ARTBA has posted on its Twitter page this week. If America is to meet its mobility and environmental challenges during the 21st century, policymakers at all levels of government must invest in significant new capacity for both road and public transit systems—and not invest in one mode at the expense of the other. The end result of such an integrated approach would be an ever cleaner and more efficient energy use in the transportation sector for the future. The men, women, companies, public agencies and educational and research institutions that comprise the membership of ARTBA will continue to play a special role in meeting these challenges, because we are at the nexus of transportation infrastructure and the natural environment.